Fenrik is an ex-Vigilant of Stendarr who has contracted vampirism. 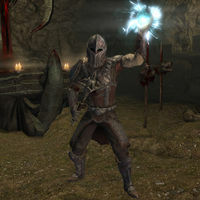 He is the leader of a Daedric cult and has made a pact with Molag Bal to sacrifice nine of his fellow Vigilants in return for a vampirism cure. He has constructed an altar to Molag Bal within a hidden chamber inside Quicksilver Mine in Dawnstar. You will be tasked with killing him and his thralls during the related quest. He wears a full set of Vigil Corrupted armor and carries his journal. Unholy Vigil: Investigate the mysterious disappearances of Vigilants of Stendarr in the Pale. This page was last modified on 20 January 2019, at 18:45.